Moraira ist gesegnet mit einer großen Auswahl an stilvollen Cafés, um im Rahmen ihrer angenehmen Straßen und bietet eine große Auswahl an nationalen und internationalen Küche. Moraira / Teulada, beautiful plot, with wide, open views to the beautiful vine yards from Moraira and its blue, Mediterranean skyline. The plot is about 5 km, from Morairas town centre, and a short walk from Teulada away. it is in a resort, with communal pool and tennis courts, although most of the high class villas in this area do have their private pools as well. With electricity, water and drainage. Ask MNM Costa Blanca for their actual offer for high quality new construction villas. Plot in luxury resort. 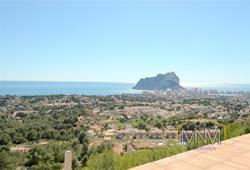 Wonderful SEA views, just 10 minutes to Moraira. In this area, with luxury villas, we offer you a beautiful plot. Very natural area, with beautiful local flora. Sea, Mountain and valley views. This resort offers you exceptional places to enjoy life. Villa with guest apartment and STUNNING VALLEY VIEWS on an outstanding location! Enjoy stunning views to the impressive Teulada valley with lots of orange groves on one and the mountains on the other side. STUNNING SEA VIEWS! Luxurious, elegant and spacious apartment located at one of the most prestigious and exclusive developments on Cumbre del Sol. THE SEA VIEWS FROM ITS HUGE TERRACE ARE BREATHTAKING! Moraira, 4 bedrooms, 3 bathrooms. 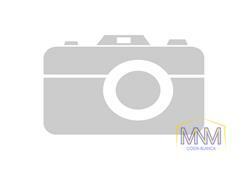 A beautiful SEA VIEW property on a beautiful location, in the quiet and well knows San Jaime area. The villa, amidst from a high class neighborhood, with nice sea views from the main level. With 4 bedrooms, 3 bathrooms, terraces, garage, private pool. Moraira, 6 bedrooms, 3 bathrooms. A very appealing, LARGE SIX BEDROOM modern villa JUST 3 KM FROM THE VILLAGE Moraira. A nice property well worth to be visited. 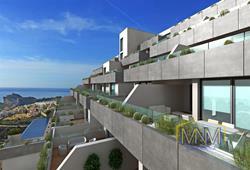 ELEGANT SEA VIEW VILLA IN MORAIRA, 3 Bedrooms. A charming three-bedroom villa in Moraira. The villa, built in 2.004, but as new, is very private and enjoys lovely sea and mountain views. With a large pool and pool terrace, this villa is ideal for holidays or the whole year around. Cumbre del Sol, DESIGN SEA VIEW VILLA. The imposing new-build villa, surrounded by an international neighborhood with, to a certain extent, opulent dwellings, is plain and simple, without added frills, and dazzlingly white, impressively emphasized by almost artistic exterior areas with features such as, quite beautiful exterior, an exceptional entrance gate, a deep-blue pool and glorious sun terraces. Moraira, area IBIZA STYLE SEA VIEW VILLA. Large, panoramic windows capture the enchanting landscape effectively, on all sides, and convey a brightness and elegance throughout the sophisticated rooms, while the best build-quality and the most exclusive fittings allow for that ambience of well-being, together with the superior flair of the classically modern and up-to-date comfort.